You may need to know this little trick when trying to repair a Maytag dishwasher with a drain problem. 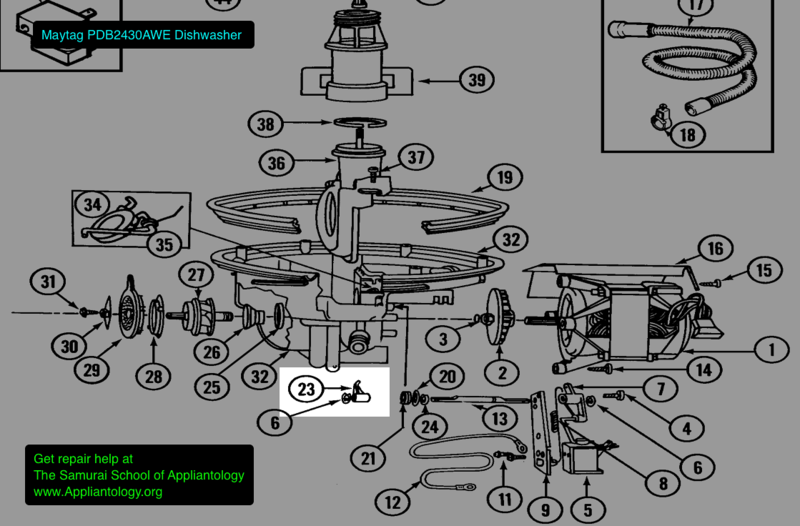 This trick applies to Maytag dishwashers with model numbers starting with PDB, such as PDB2430AWE. After checking the usual suspects, check the drain solenoid. Two tests are required here: first, check the continuity of the solenoid coil; second, make sure it’s getting 120vac during the drain cycle. If either condition fails, then replace the drain solenoid. Now, here’s where the trick comes in. You may find that, after replacing the solenoid (or before! ), the solenoid plunger flings out when it’s time to drain. Dontcha hate when that happens? The solution is stunningly simple and, best of all, the part costs less than a buck. How’s that for the deal of the day? The problem is a broken lifter; you can see it in this diagram as item 23. To replace this humble little part, first take off the top cover on the dishwasher motor. Do this by unscrewing the tower, removing the spray arm and pulling the cover off. Again, refer to this diagram. Once you get all that schtookus outta the way, you’ll expose the lifter linkage. You can tell the lifter is bad (or as we professional appliantologists like to say, “Vees badden”… that’s a little German lingo fer ya) because it should be in the shape of an “L.” If’n it ain’t, then the metal arm of item 34 will have too wide a range of motion and, as a result, the solenoid plunger will drop out. You can buy the all-important lifter here. This entry was posted in Dishwasher Repair on April 3, 2006 by Samurai Appliance Repair Man. This posting saved us a lot of money in repairs, or a new unit. The symptoms matched this and, sure enough, that lifter was broken. Your instructions were right on target. Easy to locate. Cheap to buy. Easy to replace. One footnote: after our solenoid plunger popped out, the voltage began to melt the solenoid. The plunger could no longer slide back in due to the melting so, it, too had to be replaced. Again, a simple enough process. The part sells for $15 to $20.